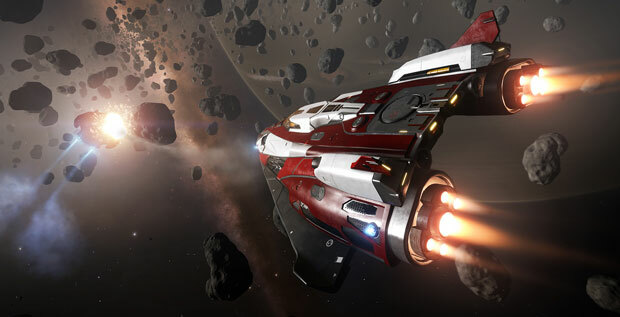 Here are some hints, tips and tricks for the space exploration, trading and combat game, Elite Dangerous. You can find both beginner and advanced tips here. Reseting Missions - If you don't like the missions offered at a terminal or there are no missions available, you can log out and log back in by going to the main menu for new missions. More agile movement - Though you may be tempted to hit full throttle during combat, keep in mind the slower your speed, the more agile your ship will be making turning and locking onto a target easier. This is also the case when simply flying around a system. Also note that upgrading your ships thrusters not only increases ship speed but also Pitch / Roll and Yaw speed as well. Fuel Scoop - Make sure you buy a fuel scoop for your ship as soon as you can. You can fuel up at most stars when entering a system, and not have to worry about running out of fuel if there are no space stations to refuel in that system. Just be careful not to get too close to a star, as your ship will quickly overheat. Finding the docking area - Sometimes it may not be clear where the docking area is. When docking, look for the blue dot on your radar for easier navigation. Scanning Systems - As soon as you can, buy a discovery scanner and try to use it in every system. There are many objects to discover in systems. Solar System Navigation - Make sure you have orbit lines turned on (press 4, go to functions, and turn on orbit lines) to navigate solar systems and find bases easier. Power Control - Make sure you use the arrow keys to asign power to certain systems. For example, during combat you want to go full weapon power, during exploration and cruising you may want to switch to full engine power. Discovering Stars - You can also discover unknown stars by pointing your ship towards them, then targeting them with T, and using your discovery scanner. You can also discover Unexplored objects and places this way by flying close to them. Precise Flight - Turn on show mouse widget in the control options for more precise flying. Going to Earth - In order to go to Sol and visit our solar system, you must first do missions for the Federation. You can also trade and do bounties for stations that are owned by a faction that is allied with the federation. Once you reach high enough standing, you can take progression missions to rank up within the federation. A good place to grind some Federation reputation is Sothis / Ceos. Try doing Data delivery missions. Fed Unite and Sirius have federation alignment. Better missions - If you find missions are becoming too tough for require too much reputation, head back to your starting system as you will find the best missions for beginners there. New Missions - A recent update added the Passenger Lounge, here you can find all sorts of profitable missions as long as you meet the reputation requirements! Finding goods - Some missions will require you to deliver specific goods to the station. In order to find the goods, open your galaxy map, and click Map on the trade map. This will list all items you can find. De-select everything with the "clear" button and then select the goods you are looking for. This will create a line showing direction of trade of this particular good. You can then purchase and deliver these goods to complete your mission. Going AFK - Be careful when going afk in Elite Dangerous. Since you can't pause the game, an enemy could jump in and attack you at any time, and destroy your ship. If you want to go afk, press ESC and go back to the main menu to log out first. Good early combat setup - A good setup for weapons in early combat is a double beam laser, and double multi cannon setup. Stranded - If you run out of fuel and become stranded, the best solution is to self-destruct the ship. This will place you back at the last save point, but keep in mind you will have to pay if you want to repurchase your ship and all of the modules. If you have any other Elite Dangerous tips, please post them in the comments below.